Completely revised and updated, the Fourth Edition of this popular resource recognizes the emerging importance of planned giving and the changes that have taken place over the last few years. The new edition now includes a convenient, easy-to-use CD-ROM filled with exhibits, documents, and forms. With a new focus on user-friendly content and helpful insights, tips, warnings, and perspectives, the new edition empowers fundraising professionals with the ability to speak the same language as donors and their advisors, while still keeping their own organization's goals in mind. Ronald R. Jordan is an assistant professor at New Mexico State University, where he teaches courses on ﬁnancial planning, consumer economics, and business and professional writing. He also consults with nonprofit organizations. He is a graduate of New England School of Law and was admitted to the practice of law in Massachusetts in 1975. Before retiring, he was the assistant vice president of university advancement at New Mexico State University and former director of planned giving at Boston University. Katelyn L. Quynn is executive director of development at the Massachusetts General Hospital. She is a past president of the Planned Giving Group of New England (PGGNE) and former board member of the National Committee on Planned Giving. She was named Planned Giving Professional of the Year in 1996, and in 2003 she received the David M. Donaldson Award for leadership in the ﬁeld of planned giving from PGGNE. She graduated from Tufts University and Boston University School of Law. Chapter One: What Is Planned Giving? Chapter Two: Charitable Gift Annuities And Deferred Gift Annuities. Chapter Three: Pooled Income Funds. PART TWO: ASSETS INVOLVED WITH PLANNED GIVING. Chapter Seven: Gifts of Securities. Chapter Eight: Gifts of Real Estate. Chapter Nine: Gifts Of Tangible Personal Property. Chapter Ten: Gifts of Life Insurance. Chapter Eleven: Retirement Planning And Planned Giving. PART THREE: PRIVATE GIVING PROGRAMS ON LOCATION. Chapter Twelve: What Charities Can Learn About Fundraising And Planned Giving From Other Charities. Chapter Thirteen: Planned Giving in a Small or One-Person Organization. Chapter Fourteen: Planned Giving at Educational Institutions. 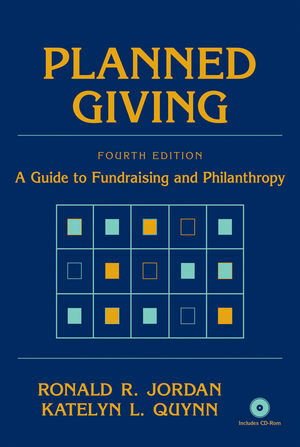 Chapter Fifteen: Planned Giving In Healthcare Organizations. Chapter Sixteen: Planned Giving in Large, Established Arts Organizations. PART FOUR: MANAGING DONORS AND PROSPECTS. Chapter Seventeen: The Planned Giving Prospect. Chapter Eighteen: Refocusing On Philanthropy. Chapter Nineteen: Working with Donors. Chapter Twenty: Women as Planned Giving Donors. Chapter Twenty-One: Family Philanthropy: Issues and Solutions. Chapter Twenty-Three: When To Walk Away. Chapter Twenty-Four: (Fundraising Etiquette: Do's And Don'ts For Successful Business And Social Interactions With Donors And Prospects. Chapter Twenty-Five: Negotiating the Gift of a Lifetime. Chapter Twenty-Seven: Combating Donor Fatigue And Overcoming Organizational. PART FIVE: PLANNED GIVING'S FINANCIAL IMPACT. Chapter Twenty-Eight: The Tax Consequences Of Charitable Gifts. Chapter Twenty-Nine: Estate Planning and Planned Giving. Chapter Thirty: Financial Planning for the Development Professional. PART SIX: MANAGING A PLANNED GIVING PROGRAM. Chapter Thirty-One: Inside The Development Office. Chapter Thirty-Two: An Operational Plan For A Planned Giving Program. Chapter Thirty-Three: Working as a Successful Planned Giving OfFIcer to Raise Charitable Funds. Chapter Thirty-Four: Planned Giving And Major Gifts. Chapter Thirty-Six: Increased Management Responsibilities In The Development Office. Chapter Thirty-Seven: Managing Time In Planned Giving. Chapter Thirty-Eight: Leadership And Management For A Development Team. PART SEVEN: MANAGING OUTSIDE THE OFFICE. Chapter Thirty-Nine: Mobilizing The Nonprofit’s Leadership. Chapter Forty: Creating A Volunteer Society For A Development And Planned Giving Program. Chapter Forty-One: Working With Nondevelopment Staff. Chapter Forty-Two: Evaluating A Planned Giving Program. Chapter Forty-Three: Measuring Performance For Planned And Major Gift Staff. Chapter Forty-Four: Drafting Planned Giving Documents. Chapter Forty-Five: Printed Materials And Publications For Donors And Prospects. Chapter Forty-Six: Marketing The Noneconomic Benefits Of Philanthropy. Chapter Forty-Seven: Making Planned Giving Presentations. Chapter Forty-Eight: Marketing Planned Giving To Professional Advisors. PART TEN: POLICIES AND PROCEDURES. Chapter Forty-Nine: Gift Acceptance Policies. Chapter Fifty: Nonprofit Organizations: Development Practices And Problems. Chapter Fifty-One: Policies and Procedures for Naming Opportunities. Chapter Fifty-Two: NonproFIt Investment Policies and Procedures. Chapter Fifty-Three: Raising The Bar: Increasing Endowed Fund Minimums. PART ELEVEN: PLANNED GIVING IN CONTEXT. Chapter Fifty-Four: Ethics And Planned Giving. Chapter Fifty-Five: Planned Giving And Capital Campaigns. Chapter Fifty-Six: Stewardship and Planned Gifts. Chapter Fifty-Seven: Institutionally Related Foundations. Chapter Fifty-Eight: Outside Asset Managers: Policies and Procedures.